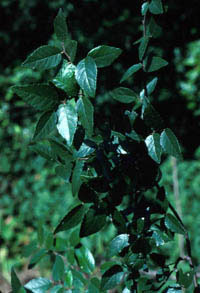 Water elm grows in wet areas, usually standing water, in the eastern part of the state. It is a small tree, usually around 25 feet, although it can grow as tall as 40 ft. It usually flowers in mid- to late February, with curious, warty fruit maturing in four to six weeks. The bark is composed of light gray to light brown scales that peel back to reveal the red-brown bark underneath.